Foodzy - a new, self funded start-up based in Amsterdam - announced their limited private beta launch at the second day of The Next Web conference earlier this morning. 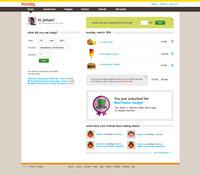 Foodzy.com helps users keep track of what products they eat during the day, and it rewards healthy and fun eating habits with badges. This way people are able to maintain a healthy lifestyle, start losing weight or simply keep track of their own and their friends' eating preferences. Foodzy works with local food databases, so users only find food products from the country they live in. If a product is not available yet, users can easily add it. Every product has a certain amount of 'bits': a simple conversion of calories. An average sized 30-year-old male that exercises on a daily basis is allowed to eat around 150 bits per day. If that same man wants to lose weight, he can start a diet plan and eat an average of 120 bits per day. People that regularly eat vegetables, fruit or fish will over time win special badges for their healthy eating habits. But Foodzy's primary goal is not to be all about health or weight loss. Foodzy believes the best diet is to eat well, varied and enjoy food. Therefore it will also reward other - more fun - eating customs like a Birthday badge for eating cake on your birthday, or a BBQ badge for BBQ-ing more than 5 times during the summer. Enjoying food with your friends and competing with them for special badges while enjoying variety is where the fun and - ultimately - added value of Foodzy lies. Foodzy also offers the possibility to view detailed statistics of your food habits like the amount of bits you eat per day, your favourite products and friends that have most similar eating preferences. In the future, Foodzy's API could also offer the possibility to connect the service to hardware devices like WIFI scales, Nike Plus or XBox Kinect, and make the experience even richer. Using Foodzy is free with a Lite account, but your food history is kept for a limited period of time only. Users that upgrade to a Pro account for only $15 a year, receive an unlimited food record, as well as detailed insights in their food statistics, more badges and the opportunity to start diet plans. Foodzy announced the launch of its limited private beta at The Next Web conference earlier this morning: 500 of the very first accounts have been made available to attendees of the conference at beta.foodzy.com using a limited promo code. 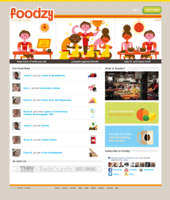 After another couple of weeks of testing, Foodzy is expected to go in public beta in May 2011. Mobile site and apps will soon follow. Foodzy is a self-funded startup based in Amsterdam, The Netherlands. The social service for web and mobile soft-launched in private beta at The Next Web Conference 2011 - where it was awarded 'Best Pitch' in TNW's Start up Rally. Since its global launch in July 2011, Foodzy’s database has grown from 50,000 to over 500,000 food products, most of it crowdsourced by users. The service uses localized product databases per country, so users can easily search for the products available in their local supermarket. Foodzy is currently available in 140 countries and six languages. Foodzy - the social food game that lets you easily check in your daily food & drinks intake - launches a lite version of its mobile apps for iPhone and Android today that enables all users to try the service for free or create a new account. Pro users of the service receive an all new and improved personal dashboard in the app’s most recent upgrade, and keeping track of your weight just became easier now that you can import your Withings WIFI scale data automatically into Foodzy. Foodzy, the social game for food lovers and health freaks, is now available for Android and iPhone. 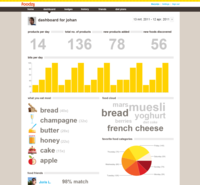 Foodzy lets you keep track of what you eat, giving you in-depth statistics and badges for healthy living in return. The apps are available in Apple's App Store and Android Market for free, but users need a Foodzy Pro account to use them. Since its public launch about a month ago, Foodzy.com registered thousands of new users all over the world. Since a large majority of them are from Europe, the service has now been made available in both German and French. Both interface and food databases have been translated, and hundreds of locally available products were added. Users in Germany, Austria, Switzerland, France, Belgium and Canada can now start keeping track of their eating habits in their own native language.